There is something about the quiet harmony of this painting that I find really pleasing. The geometric details and clarity of light and air turn an everyday scene into a masterful work of art. The artist has chosen the asymmetric composition with precision and control, selecting and cropping the scene to create intrigue and balance. Yet it still has a feeling of effortlessness and informality, as though we have stepped into a room and happened upon the scene. 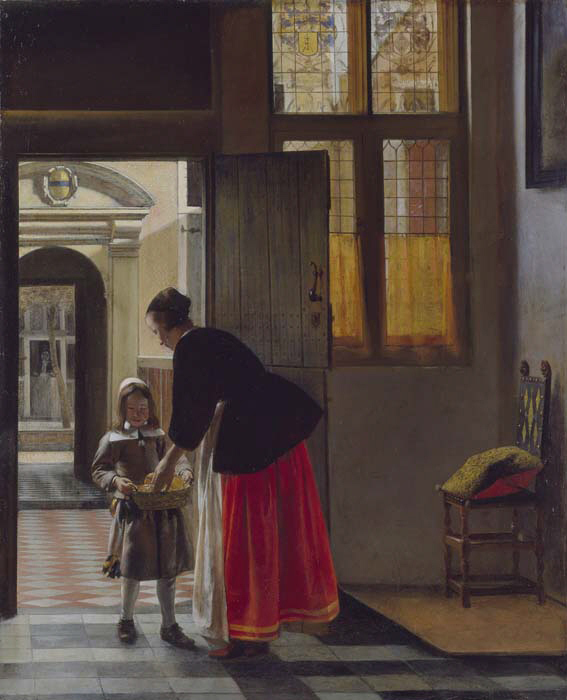 The open door before us reveals a courtyard, through which we can see a passage, over a canal and to a stable or Dutch door beyond, behind which a woman stands. Blocks of solid colour and repeated patterns fill the internal and external space, creating a sense of airiness and recession, and balancing the picture. I love the window, the delicately leaded stained glass has a strong rectilinear structure, while the yellow curtain below filters the light softly. There is so much detail that the two figures in the scene are almost secondary to their setting. We stumble across them as they interact, a moment in time paused to show the beauty and peace of everyday domestic life. Like most Dutch Golden Age artists, Pieter de Hooch mainly painted middle-class domesticity, finding inspiration and interest in the most ordinary of subjects. In paintings such as these we get a glimpse of peace and prosperity of life in the 17th century Dutch Republic. The artist was interested in optics and the play of light. He often used a restricted palette, which gives an identifiable style to his work. There is little adherence to the rules of colour in atmosphere and perspective and so there is something too perfect about it. The stark sunlight is modulated and everything is so clean, like a stage set, and the figures are posed subtly but with the intention of creating an illusion.